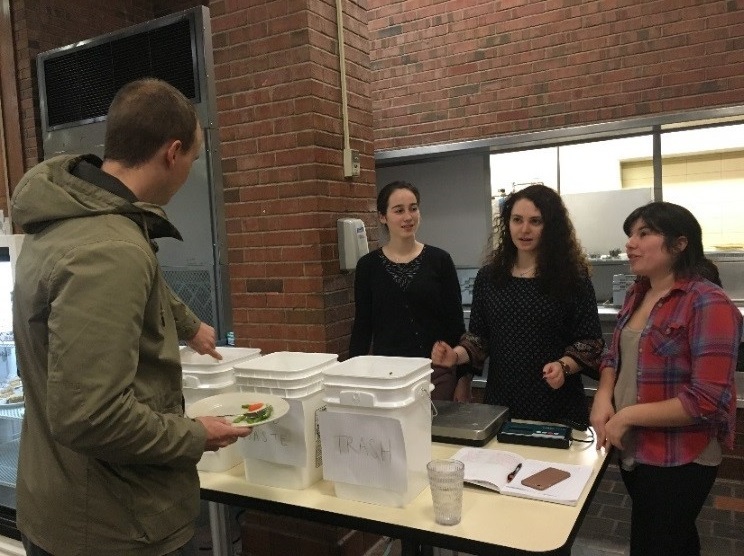 In an effort to get students to be aware of the sheer quantity of post-consumer food wasted at UConn, EcoHusky conducts food waste studies each spring. For one week, student volunteers go to a selected dining hall over the course of four dinners, Monday through Thursday. 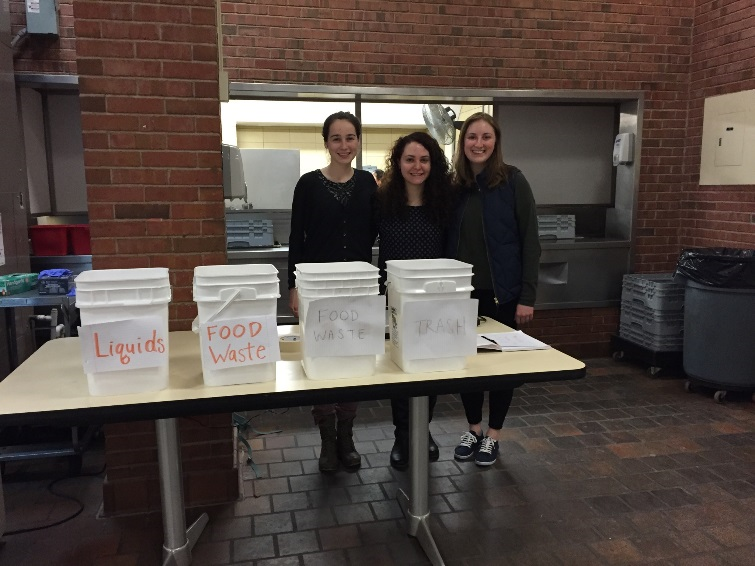 This year, the study was conducted in Putnam Dining Hall during the week of February 1st, where a total of 256 pounds of food waste and 135.6 pounds of liquid waste were collected. This is a 61% drop in food waste from last year’s study in South Dining Hall where 660 pounds were collected, but this can be attributed to the fact that significantly less students eat at Putnam compared to South given its size and location. One of the most exciting parts of the study is when students express interest in why we are collecting their leftover food, and are then both surprised and concerned when they see the amount of food waste in the buckets. On a normal day when the study is not being done, students are required to scrape the excess food from their plates into the garbage before they return them, but this is oftentimes done mindlessly without further thought as to what happens to that waste. The study does a great job in opening our eyes to how our individual and seemingly harmless everyday acts accumulate into much larger problems. If you follow current events in environmental policy, you’ve been getting a real lesson in Constitutional checks and balances among the three branches of federal government. And if you consider yourself an environmentalist, you’re probably as shocked and angry as we are about the U.S. Supreme Court’s decision last week to stay implementation of EPA’s Clean Power Plan (CPP). This decision overturned a lower federal court’s decision and occurred months before that court (the DC Circuit Court of Appeals) was scheduled to rule on the merits of a lawsuit challenging the legality of the CPP. The lawsuit was brought by 29 coal-burning/mining and oil-producing states, along with other fossil-fuel industry interests. The Supreme Court’s 5-4 ruling was along ideological lines, with five of the more conservative justices voting to block the CPP and the four progressive judges voting against the stay. The CPP is EPA’s primary regulatory tool for achieving carbon reductions over the next 10+ years, and it’s our nation’s best hope for achieving the progress called for in the Paris Agreement. It’s also pretty flexible, setting carbon reduction targets and giving each state wide latitude to figure out specific plans. Fundamentally though, it’s focused on forcing coal-fired power plants to reduce their carbon footprint or shut down. So the Supreme Court’s decision was a huge victory for the climate deniers and a major setback for the rest of us. Below are links to two of the many recent articles and opinion pieces about the SCOTUS’s ruling. As a result, in just a few short months, “climate realists” went from the highest of highs (COP21 and the Paris Agreement) to the lowest of lows. 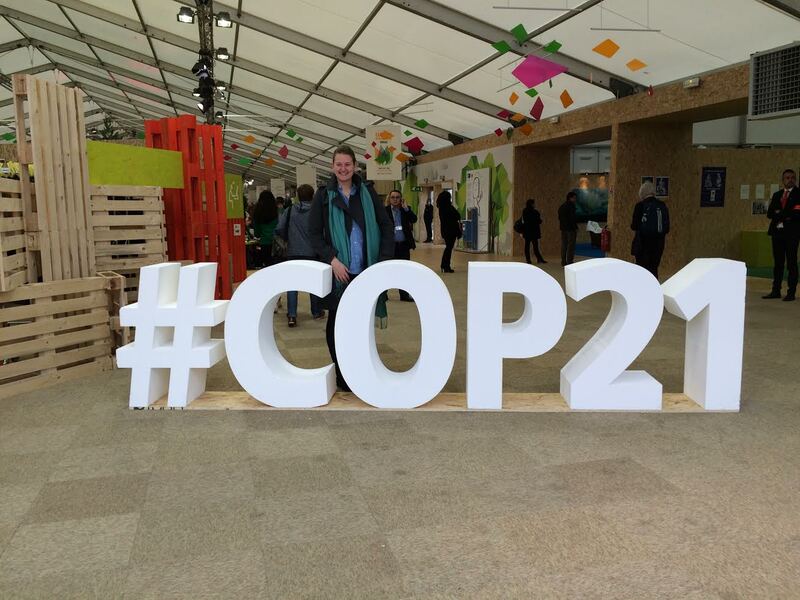 Count the UConn@COP21 group among the devastated. 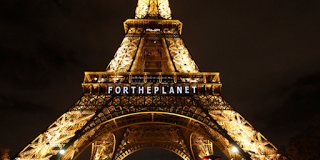 About a month ago, a colleague from the University of Colorado – Boulder posted a triumphant blog about the Paris Agreement. He remarked about how, in the weeks leading up to the Climate Summit in Paris, the presidents, chancellors, or other EVPs at more than 300 colleges and universities (including UConn), had signed a pledge advanced by the Council on Environmental Quality and Second Nature, reaffirming our commitments to climate leadership. Then, the strangest twist of fate occurred last weekend. The Supreme Court’s most conservative member, Justice Antonin Scalia, died unexpectedly while vacationing at a Texas resort – may he rest in peace. But had he died a week earlier, SCOTUS would have been deadlocked in a 4-4 vote and the lower court’s ruling rejecting the stay of the CPP would still stand. The net result of this sequence of events, is that the issue of climate change, already far more politicized than it should be in the U.S., has now become even more entangled in the highly-polarized Presidential campaign. Under the Constitution, the President nominates federal judges to fill any vacancy, like Scalia’s, and the U.S. Senate then approves or rejects those nominees. The next appointee to the SCOTUS could dramatically influence the outcome of close decisions on the most politicized issues for decades to come, including the likely appeal of the lower court’s decision in the CPP case. Conservative Republicans who control the U.S. Senate, mostly representing states that are still heavily dependent on cheap and dirty coal for generating electricity, are threatening to block approval of any nominee advanced by President Obama. Meanwhile, the more progressive West Coast and Northeastern states, like Connecticut, which have long since transitioned away from coal, might actually stand to gain an economic advantage through the enactment of the CPP. Our state and others are joining EPA in the legal defense of the CPP and would like to see the President appoint a climate realist to SCOTUS, sooner rather than later. It seems like now might be a good time for higher education to exert some climate leadership. With the Supreme Court’s decision, climate realists are on the ropes and the climate deniers are closing in for a knockout. EPA simply cannot lose this case! The CPP would have obvious air quality and public health benefits, all the way up to preventing the most catastrophic consequences of global warming per the Paris Agreement. But what can we do? Is there a role for law school faculty and students? If so, I hope our best and brightest are willing and able to step up to the challenge. Up first, wait till the dishwasher is full, perhaps even overflowing, to run it. Less cycles mean less water, and less cycles mean less of those pesky, pricey detergent pods. Same idea goes for your laundry, wait for a full load. It will spare you from doing that cumbersome washer-dryer transfer too often, which, without fail, will cost you a lost sock (or three). Layer up in the winter rather than turning up the thermostat dial or calling in the Hilltop Apartments automated thermostat adjuster. This saves a ton of energy and therefore greenhouse gas emissions from burning natural gas to heat your college-home. Staying in the 68-72 range will assure the most optimal blend of comfort end eco-friendliness. When boiling water, fill the kettle up with the amount of water you need. For example, if drinking a cup of tea in your favorite mug, fill that mug up with water and put it directly in the kettle. 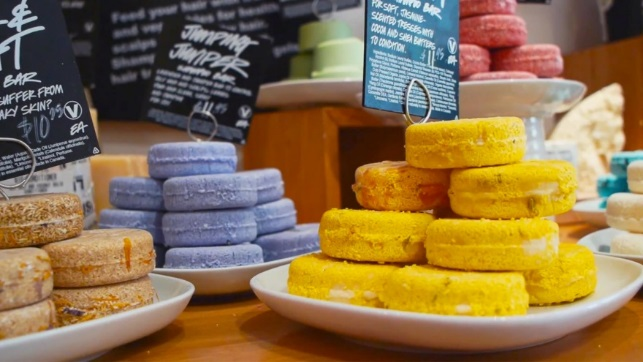 Make eco-friendly choices when it comes to purchasing toiletries such as buying in bulk or at stores with zero-waste option packaging such as Lush Cosmetics. Before Storrs turns into an icy wind tunnel, the farmers market on Storrs Road by the Town Hall is a great place to buy some fresh vegetables, fruits, jellies, pies, baked goods, and even hot sauce. The temperatures do drop, but that is no reason to stop buying local or supporting your local businesses. In fact, the Buy CT Grown website is your one-stop resource to find all things grown here in CT. You can use their search taskbar at the top of page to search for a product or check out the trails which detail all the different ways you can buy locally with different themes such as wine, beer, cheese. Coming soon: the UConn trail. 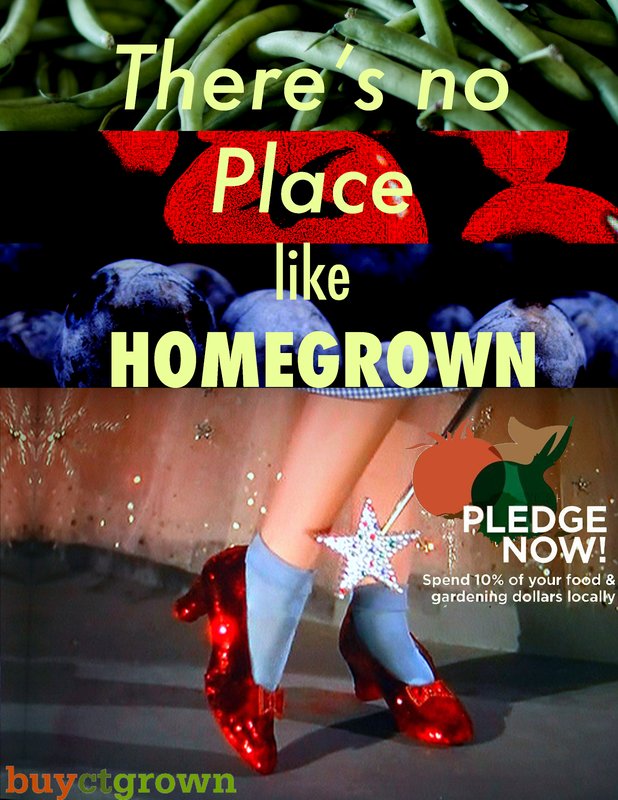 If buying local is something that truly strikes your fancy, take the 10% local pledge and spend 10% of your food and gardening dollars locally. Visit http://www.buyctgrown.com/ to learn more! Among 407 participating universities from 65 countries, UConn has been ranked #2 in the 2015 UI GreenMetric Ranking of World Universities, and has maintained its #1 ranking among those with rural campuses. UI GreenMetric is an annual sustainability survey focusing on a combination of indicators including setting and infrastructure, energy and climate change, waste management, water, transportation, and education. With a total score of 7,156, UConn ranked highest among its peers in energy and climate change, with strong scores in the education and setting and infrastructure categories, as well. The energy and climate change section is weighed most heavily in the ranking, as it encompasses a wide range of indicators including green building, greenhouse gas emissions reduction policy, and climate change adaptation and mitigation. It is also important to note that this was the first year that the GreenMetric survey included a carbon footprint evaluation as part of its criteria. Nearly 50 more schools participated in 2015 than in 2014, yet UConn still succeeded in moving up in ranking from #7 to #2. This we attribute to a variety of efforts and accomplishments. As a signatory of the American College and University Presidents Climate Commitment (ACUPCC), recently renamed Second Nature’s Carbon Commitment, UConn made a promise to aim for carbon neutrality by 2050. Thereafter, all decisions regarding campus projects have been made with greenhouse gas emissions in mind, outlined in our Climate Action Plan. Apart from the presence of a wide range of sustainability initiatives at UConn, we attribute much of our success in the ranking to the diligence and cooperation of those involved in obtaining and compiling all of the data and information into concise, yet comprehensive, responses. The following post is a kick-off to a series of posts written to help you make greener changes to wherever you live on campus. I know that serving as a steward to your environment alone does not drive all of us to change our actions. However, one thing that does is that greenish, crinkly, paper/linen stuff: money. All of these tips can lessen your environmental footprint while also leaving money in your bank account. Savers, Salvation Army, UConn Buy or Sell: all of these shopping arenas are second-hand stores where you can find clothing, couches, chairs, tables, glasses, cookware, and even old Backstreet Boys CD’s. 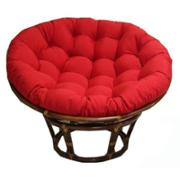 I have never received more compliments on a piece of furniture than my red cushioned papasan that I bought from the Salvation Army. Many might ask, what is a papasan? Well, it is a stylish chair made famous by Pier 1 Imports Furniture that goes for $149.95 ($79.95 for the frame $70 for the cushion). I bought it from a thrift store in a used, like-new condition for $15. Not only did I save over $130, but by buying something in its second, third, maybe fourth cycle from a local enterprise, I prevented a new papasan from being made in the long-run (saving the environmental impacts of manufacturing and transportation) and my $15 dollars went to a social cause rather than straight into Pier 1’s income accounts. Second hand stores are a beautiful opportunity to find cheap deals and to make a statement with your purchase. Consumerism is a rampant idealism of our society, but buying brand new doesn’t benefit your budget or the environment. So what does purchasing second-hand do? It gives you more power for your dollar. Instead of feeding a wasteful lifestyle, your money instead goes to the local economy, your pocket, and supports a larger shift towards a more sustainable society that uses existing resources to fulfill current needs. Also, by shopping at more charitable organizations you are investing your dollar in helping others. The Salvation Army who take 82 cents of every dollar to providing to food distribution, disaster relief, and other beneficial community programs. Editor’s note: Yes, buying used items can be deemed “unsanitary”, “mysterious”, even “dangerous,” so play it smart and enjoy the hunt. Look for the items that look the cleanest and a few thorough washes are never a bad idea!